Singapore may be a Little Red Dot, but when it comes to hosting a smashing party, trust the People’s Association (PA) to hold the largest annual street performance and float parade — Chingay — in Asia. Since the first parade was mooted by then-Prime Minister Lee Kuan Yew in 1973, it has cemented itself as an integral part of Singapore’s collective identity over the years. Each year, Chingay offers a vibrant and energetic display of light, music and festivities that celebrates Singapore’s multicultural society. Part of the appeal of the mega event is that it typically draws performers from all over the world, but nothing beats having equally talented local performing groups that bring out the Singapore spirit in those who show up — rain or shine — to lend their support, and of course, catch a good show. But next year’s parade looks to take it up a notch with the inclusion of the first-ever PAssion Funtasy Competition @ Chingay 2018, aimed at discovering new talents. The competition will take place at the F1 Pit Building on 23 and 24 February, in conjunction with the parade itself. Interested parties are required to form groups of 21 to 40 members that have not participated in the parade since 2010. Each group will have to learn a fixed 90-second dance segment and come up with a one-minute choreography. Expect the entire 2.5-minute sequence to be repeated about seven times during the parade. The group with the most creative costumes, the finest choreography and the best showcase of their passion for performing will emerge as the champion and win $5,000 in cash. The first- and second-runner-ups will receive $3,000 and $2,000 respectively. Some of the local groups that will be performing at next year’s Chingay include the WeCare PALs, comprising the corporate and community partners who work hand-in-hand with PA and its grassroots networks. Among the WeCare PALs who are gearing up for the Chingay 2018 is DockSession Singapore, the local arm of a global longboarding community. As its name implies, longboarding is similar to skateboarding, only with a greater emphasis on dance steps, artistic freedom and tricks. The DockSession movement first started in Paris, France, in 2014. Within the next three years, it established offshoots in other parts of the world such as Japan, Spain and Peru. Next year, over 30 members of DockSession Singapore will be participating in the parade, showing off their skills on the board. “Being able to contribute to community togetherness through my passion for longboarding will be a very heart-warming experience. By doing this, I hope that we can connect with even more youths and working adults passionate about longboarding,” says Mr Robert Chua, contingent leader and founder of DockSession Singapore. “The members of our longboarding community come from various backgrounds and are of a diverse age range,” says Ms Geraldine Chng, active member of DockSession Singapore. The upcoming batch of participants is aged 16 to 53 years old. Diversity and a spirit of inclusiveness are exactly what Chingay celebrates. Founded in 1936, the Guang Wu Club is the only organisation in Singapore dedicated to preserving the practice and tradition of Hainanese martial arts. It used to be located at Dhoby Ghaut before moving to a Hainanese village in Somapah in 1950. During its heyday, the club enjoyed strong support, with 800 members at its peak. Although the numbers have dropped to just 210 today, the current members remain passionate about their craft. “We hope to revive the past glories of the only Hainanese wushu association in Singapore,” says Mr Lim Joo Kwan, a Pioneer Generation Member and Honorary Adviser of the Guang Wu Club. “We hope to sustain the continuity of teaching Hainan wushu to contribute to the progress of our nation’s multi-racial and multi-cultural society,” he adds. With its youngest participant at just nine years old and its oldest member at 68, the Guang Wu Club has already proven that age is no obstacle to pursuing one’s passion. Canon Singapore is another newcomer to the Chingay scene. Founded in 1937, the company is a global leader in imaging technology, well-known for its expertise in consumer, business-to-business and industrial digital imaging solutions. Canon has been serving both consumers and enterprises in Singapore for more than 35 years. Its corporate philosophy of kyosei, which is a Japanese principle of working and living for the common good, aligns with what the parade represents — a celebration that embraces people of all races and from all walks of life. 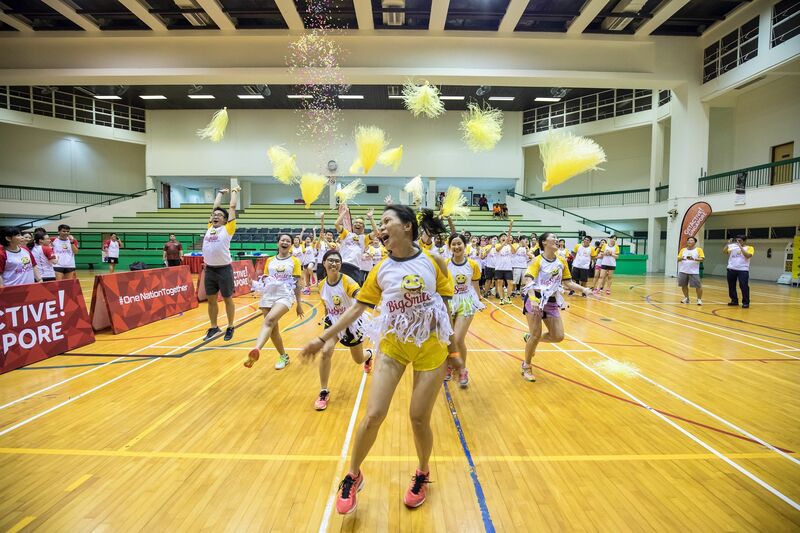 “As a multinational company, our office culture certainly complements the multicultural flavour of the Chingay Parade,” says Ms Carol Lim, Manager of Canon Singapore’s Domestic Marketing Division, who has waited 33 years to realise her childhood dream of participating in next year’s Chingay. As for her colleague, India-born Ramachockalingam Gnanasambandam Sam, who is a Singapore Permanent Resident, the opportunity to participate in this multi-cultural event holds special meaning for him. “I want to help showcase to the world that Singapore is a melting pot of cultures and international influences,” he says. Amid the sea of new faces are some veterans. Next year’s contingent from Jamiyah Singapore, also known as the Muslim Missionary Society Singapore, will be taking part in the parade for a second time. Founded by Moulana Abdul Aleem Siddique in 1932, Jamiyah aims to provide welfare services to the less privileged and disadvantaged of all races and faiths. Today, it has established education centres, welfare homes and more services such as Jamiyah Food Bank, Jamiyah Children’s Home and Jamiyah Nursing Home. A seven-year-old student from the participating group at Jamiyah’s Rivervale Student Care Centre will be among the youngest members of the parade. Through the rehearsals leading up to the main event, the students will get to develop their self-esteem, learn to be independent and raise their level of competence. Although the participation rate in Chingay shows impressive growth every year, PA believes that there is more talent waiting to be discovered and be part of one of the most spectacular parades in Asia. “The PAssion Funtasy Competition is an excellent platform for any organisations, corporate companies, performing arts, hobby and any community groups in Singapore to come forward and be counted as part of the upcoming Chingay Parade,” says Mr Julian Aw, Director of the PA’s Singapore Chingay & Events Network. To register, e-mail PA_SCENE@pa.gov.sg for enquiries. Closing date: Nov 15. Application is free.